Good oral hygiene starts with regular preventive care from a professional dental hygienist. Even though a person may have good home care, a professional prophylaxis is essential for maintaining excellent oral health. Your teeth are meant to last your lifetime and healthy teeth, bone and gums will ensure it. During your visit to our hygiene department, you will have the necessary radiographs so Dr. Cassis can diagnose your oral condition. Our radiographs are digital and require very low radiation. They are displayed on the computer screen immediately and are very clear, which allows for definite diagnosis. This also allows for the your involvement in dental care. Bitewing radiographs are taken every six months and a panoramic radiograph is taken at your first appointment, and every three years afterward. A periapical radiograph will be taken if you have a specific sensitive tooth. This film allows us to see the whole tooth including the end of the root. After the radiographs are exposed our hygienist will screen for gum disease and oral cancer. Home care instructions will be given according to your special needs. If healthy conditions are found, a thorough prophylaxis is completed and a fluoride treatment is given. If you are diagnosed with gum disease, gum disease treatment will be advised and planned or may even be performed during that visit. You will be involved during the whole appointment, in that every procedure will be explained and all questions are welcomed and answered to the best of our knowledge. Nitrous oxide, commonly known as laughing gas, is available for any patients that have sensitive teeth and/or are apprehensive about being in the dental chair. After the hygiene procedures are complete, Dr. Cassis will do a comprehensive oral examination. A written treatment plan will be completed with scheduling and financial arrangements available for discussion. Mild to moderate cases of generalized gingivitis require PerioMed to be used at home as part of routine home care regimen. It kills bacteria and shrinks inflammation of gum tissue. Patients prone to cavities and/or patients with severe hypersensitivity would also benefit from using this product at home. 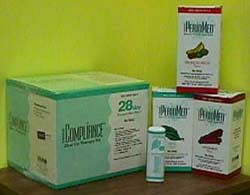 We offer three flavors, tropical fruit, mint and cinnamon. Peridex is prescribed for severe cases of gum disease or severe inflammation of gum tissue. Also, it is prescribed before and after a crown insertion to reduce bacteria and bleeding. ClosysII is an alcohol free breath control rinse that neutralizes volatile sulfur compounds that cause bad breath. Patients who use this great tasting rinse report complete confidence in their fresh breath. 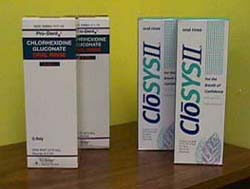 ClosysII is also prescribed for mild gingivitis to keep bacteria under control. A home fluoride treatment, .4% stannous fluoride, is prescribed for children during cavity prone years. It is also available for adults that have multiple crowns and/or receding gums. This product comes in many different flavors. Our patient's favorites include bubble gum and vanilla orange. 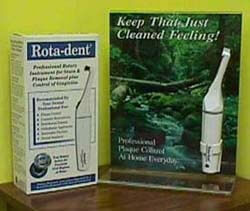 Rota-Dent is a special rotary toothbrush for home care that simulates the prophy brush used by our hygienist. Rota-Dent is a great tool for our patients with braces, thoroughly cleaning around orthodontic appliances (bands and brackets). It is especially effective for our patients with gum disease and/or those with limited manual dexterity. Breathtech is a plague fighter in a convenient pocket size spray form. It fights plaque that causes bad breath and makes your mouth feel fresh. Our whole team loves this product.